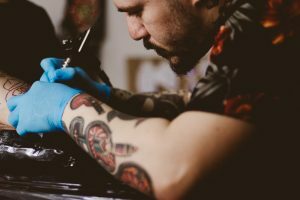 Tattoos and body piercings are invasive procedures and when performed improperly, with non-sterile equipment, or by untrained persons, they can lead to infection or blood-borne diseases such as Hepatitis and HIV. The body art program at Marion Public Health is responsible for these inspections, ensuring a safe and sanitary environment for clients. Artists have received appropriate training related to first aid and the prevention of blood borne diseases. Ensuring that artists have completed an apprenticeship or training under a skilled artist for each of the services they are performing. Click here to view our inspection reports online, or find a licensed tattoo or body piercing artist in Marion County. If you have any questions regarding tattoo/body art licensing or inspections, please call 740-692- 9116.